The diversity of the Yakima Valley is reflected within the three sub AVAs located within its boundaries. These AVAs include Snipes Mountain, Red Mountain, and Rattlesnake Hills. 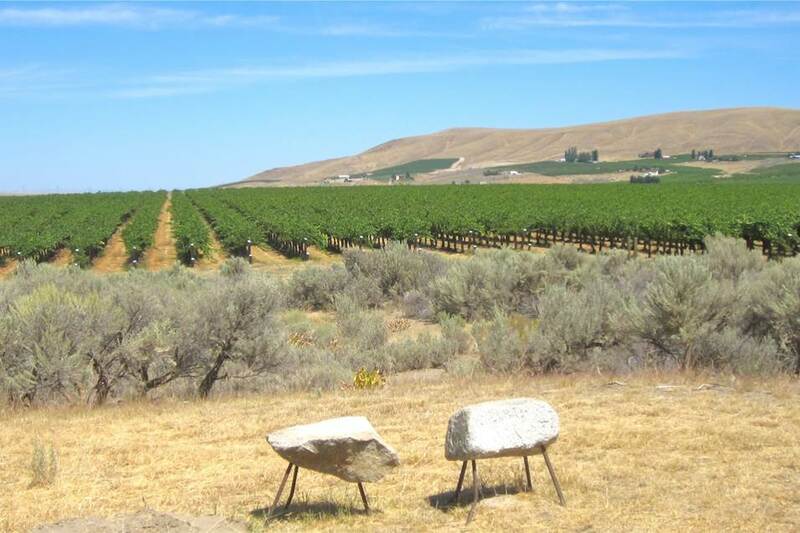 The focus of today’s blog is the Red Mountain AVA located on the far eastern side of the Yakima Valley. It is the smallest appellation in Washington State . . . just 4,040 acres of the Yakima Valley Valley’s 17,000 total vineyard acres. Due to warm temperatures red grape varieties dominate on Red Mountain. There are limited plantings of white grape varieties, particularly Sauvignon Blanc. Red Mountain Cabernet Sauvignons tend to be full bodied, dark, and dense with dark cherry aromas and flavors. While Red Mountain Syrahs are typically bold and full bodied with abundant dark fruit flavors and mineral notes. Red Mountain wines often have a distinct minerality. Elevations range from 500 feet to 1,500 feet. Red Mountain is an anticline of the Yakima fold belt, a series of geologic folds that define a number of viticultural regions in the area. The landscape takes on a reddish hue in springtime due to the abundance of cheatgrass. Red Mountain is typically Washington’s warmest growing region with broad, southwest-facing slopes and daytime growing season temperatures that average 90 degrees Fahrenheit. Red Mountain has an arid, desert climate, receiving an average of 6 to 8 inches of rainfall annually. Irrigation is therefore required to grow vinifera grapes. The nearby Yakima River moderates temperatures and provides continual airflow, guarding against frost. Nighttime temperatures drop as much as 40 degrees—helping preserve the acid levels in the grapes. Most vineyard soil is made up of sandy loam and gravel with high alkalinity (high pH) and a rich calcium carbonate content. A lack of soil nutrients along with the high pH reduces the vigor of the vines, resulting in significantly smaller berry sizes compared to varietal norms. This, along with prevailing winds, leads to higher tannin levels in many of the wines compared to other regions. The following wines represent the true characteristics of the fruit from the Red Mountain AVA. This wine is impressive and substantial, it is rich and opulent, concentrated and intense. This is a wine to savor – it lingers on your senses and makes you think. It gives aromas of Italian black plum, cassis, cocoa, cedar and vanilla and has chewy but controlled tannins. Somewhere between silk and velvet in texture. This is still young wine that will benefit from further aging. This wine earned a gold medal at the 2014 Seattle Wine and Food Experience Wine Competition. This Syrah is typical of a Red Mountain Syrah – a lot of body with dark fruit flavors and mineral notes. blackberry and raspberry aromas, backed by black pepper and bittersweet chocolate. The black pepper and bittersweet chocolate are rich, dark and luscious with smooth tannins and juicy acidity for balance. Explosive aromatics of black fruits, flint and mocha with an array of spices like cinnamon, cardamom, and black pepper on cedar. Black blue color. Deeply concentrated, there are beginnings of an ethereal quality that some great Syrah’s develop. Gamey boysenberries, strawberries and blueberries dance on the palate.